This is a sponsored post written by me on behalf of Nationwide Mutual Insurance Company regarding its In The Nation post. All opinions are 100% mine. I’ve been thinking about cars and car safety a lot lately. A few months ago, our 16-year old, 201,000 mile Toyota Camry failed California’s required emissions test. It wasn’t really a surprise, I knew big things (including the pollution-regulating catalytic converter) were starting to go, and we decided it was finally time to call it quits. But though I knew it was coming, I still wasn’t prepared to research and buy a new car. Fast forward a few weeks and I’m now the proud owner of a 2017 plug-in hybrid Chevrolet Volt. It’s a great car and I’ve been really excited to take it on summer road trips with my family and friends. New car or old, there are some things you should always do before you hit the road. 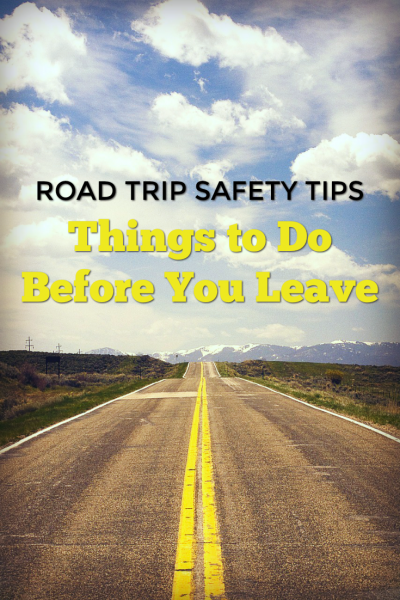 I teamed up with Nationwide to share some automotive road trip safety tips from their blog post, Safe Tires for a Smooth Ride, and some of the safety measures I take before I leave home for a long drive. Before you leave, schedule any necessary service such as oil changes, long overdue tune ups, or brake repairs. Do basic maintenance on your vehicle such as checking windshield wipers and fluid levels. Tire condition is a big part of auto safety. When I first started driving, my dad taught me the “penny test,” but in recent years studies have shown that using a quarter to check your tire tread is actually more accurate. Make sure your tires are not under (or over!) inflated. While you can use the manual tire pressure monitor at the gas station, it’s easier and more accurate to use a digital tire pressure gauge (I have a cheap one like this one). If you haven’t had your vehicle’s tires rotated and aligned recently, get that done. Tires that are not properly aligned can affect steering and suspension. Experts advise getting tires balanced every 5,000 miles or every six months. Whether you buy roadside assistance through your auto insurance company or a private automobile association, make sure you have someone you can call 24 hours a day in case you are locked out, get a flat tire, or need other assorted non-emergency automotive help. If you have a new or leased car, roadside assistance may be included by the manufacturer for the first 3-5 years. Simple, but so important! You have to be able to call for help. I always keep a zippered tote bag in my trunk that acts as my auto emergency kit and mobile earthquake kit (#CaliforniaLife). It’s stocked with some basic first aid supplies (adhesive bandages, gauze, tape, alcohol wipes), two large bottles of water, several granola bars, an old blanket, a flashlight, new batteries, etc. What things do you do before leaving on a road trip? My family and I drive about 8 hours to visit the beach every summer, so I’ve had my share of road trip experiences. Last year, our car broke down on the side of the road. Luckily, my dad was able to fix it. I really like your suggestion for getting a roadside assistance plan before going on a road trip. That would really help out if we ever break down, and my dad isn’t there to fix it. Great points there, especially about road assistance. We rent when road tripping in the US (we’re from overseas) and usually we don’t take the road side assistance insurance because it’s $6 a day and at $180 a month, we preferred to just risk it and if needs be, pay out of our own pocket to get the car towed. Next summer we’re going to Alaska, so we’ll have to see how that goes. Our road trip will see us crossing Canada on the way there and back, and some of these areas are so empty, I’m sure towing could be very very expensive. Excellent tips, may seem like common sense but it’s unbelievable how many people don’t think of these things.